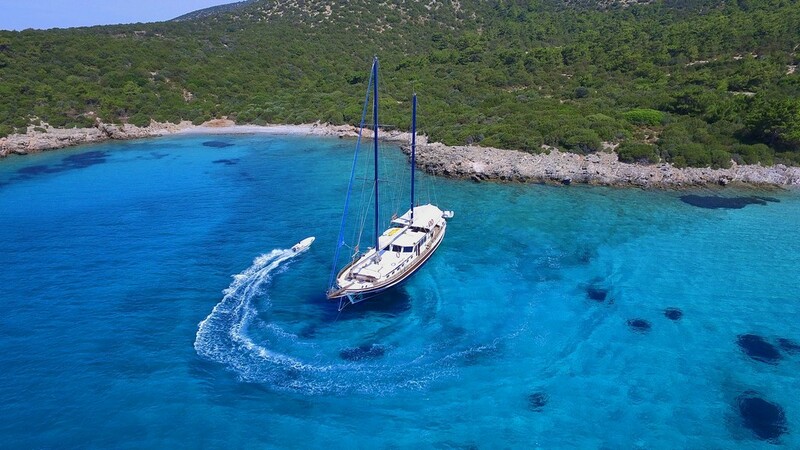 The beautiful Bodrum gulet Kaya Guneri 1 accommodates up to 16 guests in Turkey, 12 guests in Greece in 7 spacious en suite cabins with air conditioning. Each private bathroom offers a shower, vanity and toilet. There are 3 cabins with 1 double and 1 single bed; 2 cabins with a double bed; and 2 cabins with 2 twin beds. 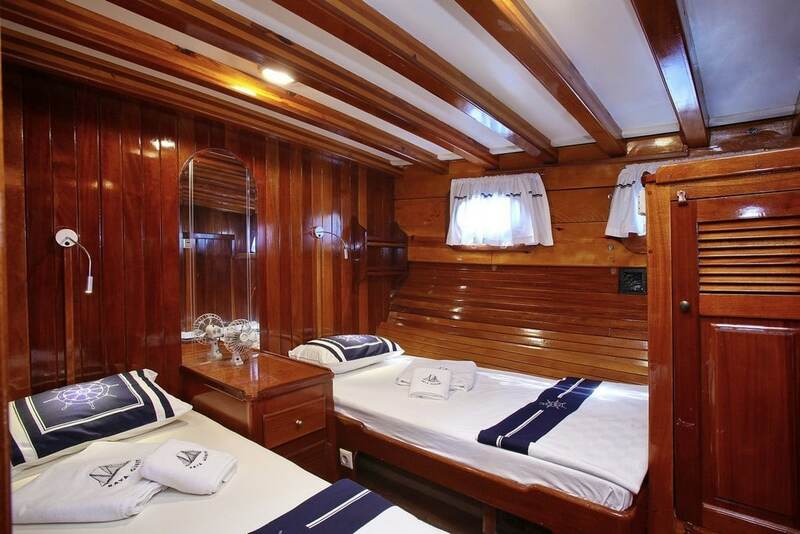 The Kaya Guneri 1 gulet has very spacious and comfortable living areas in the saloon with dinette and bar. There is a fully equipped separate galley. The aft deck has comfortable large sized cushions and dining area with large wooden table and chairs. The forward deck is also quite spacious with sun mats for each guest. Crew quarters are separate. Recreational equipment include a tender with 70 hp outboard engine, a dingy with 15 hp Yamaha outboard, Windsurf, Canoes, Masks, Flippers, Snorkels, Fishing Equipment, Music Set with CD Player, TV Connection, Backgammon and Playing cards. Other equipment include Sun Awning, Sea Ladder, Power Generator, Deep Freeze, Refrigerators, Ice Cube Maker, Hot Water System, Navigation Equipment, Mobile Telephone, Holding Tanks and Septic Tanks, and Roller Furling Head Sail.